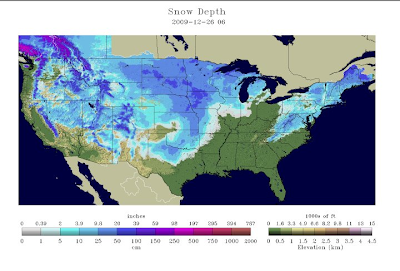 MSE Creative Consulting Blog: Above Normal Early Winter Snow Cover = Major Flooding To Come? Above Normal Early Winter Snow Cover = Major Flooding To Come? A concern: If the above normal snowfall continues, it is going to set up a situation for extensive spring flooding. The Palmer Drought Index is a weekly index, generated by NOAA, that shows the level of excessive wetness or dryness. The latest map is from Saturday, December 19th, before the latest storm occurred. Given the saturated ground in many areas, the latest snow storm significantly increases the potential for spring-melt flooding. During an El Nino year, the storm track tends to run from California and Arizona through the southern Plains and then into the Middle Atlantic states. This has been the case this year. Just two years ago the Southeast was experiencing a major drought and Atlanta was worried about running out of water. Now, the concern should be flooding. 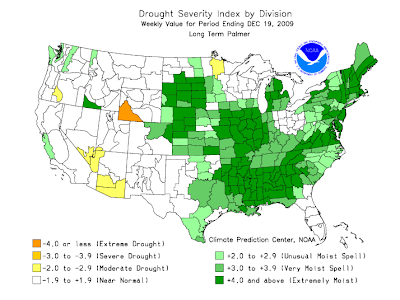 However, there is some good news here: There is no widespread severe drought anywhere in the contiguous United States. WeatherData's and AccuWeather's meteorologists will be watching this closely. We did a little research and looked at El Ninos since 1950 then screened for the El Nino values similar to December 2009's with eye toward any predictive value with regard to spring rains at Wichita's National Weather Service station at Mid-Continent Airport. Here were the results. Four years had values approximately equal to 2009's. While an admittedly small sample, it would seem reasonable to conclude that greater than normal rainfall is a real possibility this spring, causing further concerns about future flood potential.